Fresh Catch at Tino’s | tsp. You know seafood is really fresh when it has no fishy smell or taste. It releases a sweetness when you bite into it, even when breaded in salty breadcrumbs and deep fried. I remember experiencing this intensely for the first time in Maui visiting my brother years ago. We had sushi at the Ritz Carlton Hotel, which at the time had this amazing deal where locals got half off their bill on a certain night of the week. I had never had such fresh fish, buttery textured sweet tuna and shrimp. It made eating it raw a really good idea. I never used to eat fried fish until I moved to Texas, and met MG, who loves fish. I always ate scampi and baked or grilled fish in Oregon. So, I often order the grilled fish at J. Anthony’s and other places we go. Tino’s doesn’t have a lot of those offerings, but since the fish is so fresh and flavorful, I don’t mind eating it fried—the flavors still come through, especially in their jumbo shrimp. I am suspicious of battering and frying that is meant to mask low quality or bland foods. That is not the case here. Tino’s opened almost a year ago here in San Antonio, but they have been serving seafood in Brownsville for some time. They catch their own shrimp on their family boats, so this explains the freshness of the catch. It also explains why they can sell it for a fraction of what you pay for shrimp in over-priced chain restaurants like Papadeaux’s (which by the way, Tino’s sells their product to). Talk about a supply-chain edge in a competitive industry, and everyone wins. Since most shrimp served at both chains and local restaurants– even in the Gulf coast, and especially inland– is farmed in Asia or Latin America using methods that are horrendously damaging to the environment and the workers, make sure you buy shrimp labeled “wild caught” and ” gulf shrimp” so you are not supporting the farming and undermining local fishermen. One of my favorite things at Tino’s is the tartar sauce, which is homemade, and appears NOT to be made of mayonnaise. It is creamy, not oily—like it’s made of crème fresh, or a rich sour cream. Full of dill, minced onion maybe, and a few pickles. Really perfect with fried and breaded stuff—much better than dipping it into another salty oily mayonnaise dip. The house made hot sauce, habanero sauce, and cocktail sauces are great too. Spicy hot, tangy, and great mixed together in various pairs. 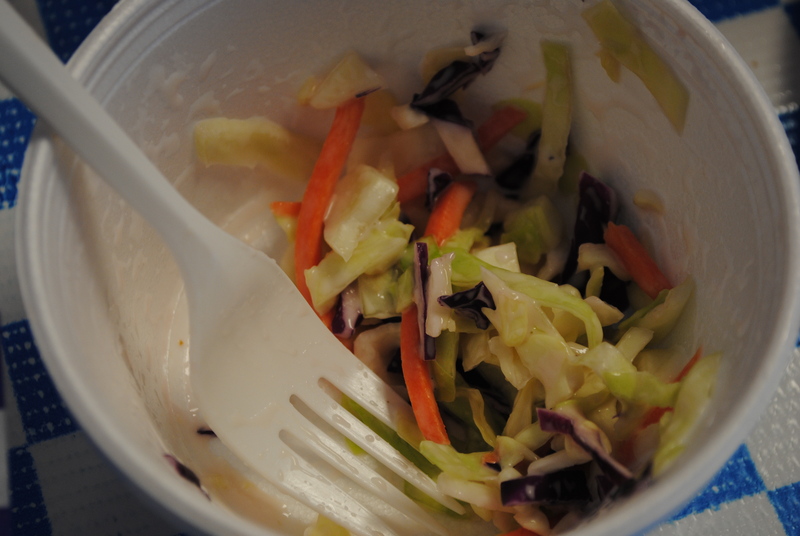 The slaw is not overly dressed and shredded in larger pieces than is typical, so you can really taste the cabbage. A good contrast to the fried fish. On to the fish– I don’t have a picture of the fish and shrimp actually, we ate it and didn’t think about pausing to get out the camera until it was over. But their website has a ton of great pictures. 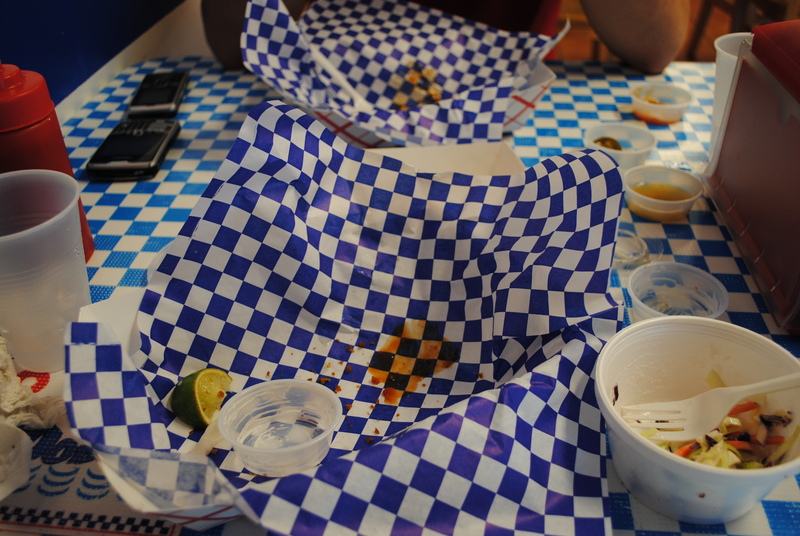 I assume you’ve all seen fried shrimp before… I had the 222, two jumbo shrimp, two oysters, and two fish fillets. The oysters were big, earthy, and of course juicy. The fish was scrod, and very tender. It is good simple food, high quality and prepared to order—no heat lamps. The line can get long, so go early.